This past May of 2015 the USFWS and the Xerces Society partnered and began work on a Western Monarch Butterfly Habitat Suitability Model (see attached flyer). The goal of the model is to help get a better understanding of where the western population of monarchs are breeding in the west, as well as to document the distribution of the monarch’s milkweed host plants. The resulting model will be used to inform western monarch conservationist’s as to the best locations to begin much needed habitat conservation projects. Now that fall is upon us and the field season is winding down, we’re gearing up to start trial runs of the model. We’ve spent the summer compiling and collecting milkweed and monarch data for the eleven states west of the Rocky Mountains: AZ, CA, CO, ID, MT, NV, NM, OR, UT, WA, and WY. However, the more data we can gather, the stronger the model will be. This is where we need your help. We hope that you’ve had a chance to get outside this summer, get your hands dirty, and perhaps collect some monarch and milkweed data while you were out there! If you were able to record any milkweed and/or monarch observations we would really appreciate if you would share those with us. We’re still encouraging folks to submit milkweed and/or monarch observations via the USFWS excel spreadsheet (attached and included in text of flyer) or the Xerces Society Milkweed Survey, located here. In hopes of capturing as much of the 2015 field data as possible, while still ensuring enough time for model results to inform 2016 planning, we’ve set a final data submission date of Monday, November 2, 2015. So if you would like to contribute to this modeling project, please report your observations by COB that date. If you choose to fill out the excel spreadsheet, please send those to Ashley Taylor at ashley.taylor@xerces.org or Liz Cruz at liz_cruz@fws.gov. Please feel free to direct any questions to either Ashley or Liz. Thank you for your time and valuable contributions to the success of this project and monarch conservation. LAKEVIEW, Ore.—Fremont-Winema National Forest officials have extended the application deadline for the national forest’s Resource Advisory Committee in an effort to encourage more Klamath and Lake County residents to apply to the 18-member volunteer committee. They have extended the applications for the Resource Advisory Committee (RAC) until Friday, September 11, to encourage the submission of additional applications. Members of the Fremont and Winema RAC collaboratively review and recommend watershed restoration and forest management projects for funding, in accordance with Title II of the Secure Rural Schools and Community Self Determination Act of 2000. Watershed restoration projects selected for funding will be implemented on public or private lands located within Lake and Klamath counties. The RAC must be balanced and diverse with equal representation from industry, environmental groups, elected officials and local residents. Membership shall include, to the extent practicable, individuals with demonstrated ability to represent minorities, women and persons with disabilities to ensure the recommendations of the committee have taken into account the needs of diverse groups. Members of the RAC volunteer their time, but are compensated for travel expenses and per diem. Meetings are alternately held in Lakeview and Klamath Falls, with some monitoring field trips scheduled each year. Citizens seeking to apply for Fremont and Winema RAC vacancies should contact Michael Tighe at 541-947-6246 (mtighe@fs.fed.us) or Fremont-Winema National Forest Partnership Coordinator Roland Giller at 541-783-4069 (rgiller@fs.fed.us). Siskiyou Field Institute offers field-based nature learning courses in and about the Klamath-Siskiyous. Dozens of classes are offered and are available for all ages and experience. Class begin at the end of March and run through the first week of November. Subjects range from beginner medicinal plants to botanizing various areas and birdwatching on Klamath Lake in a canoe. 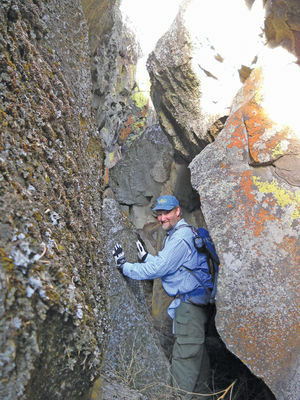 Steve Sheehy, longtime member of the Klamath Basin chapter was interviewed by Lee Juillerat for the Herald & News about his discovery of a new lichen species. Oregon State University is conducting a once-per-decade assessment of non-motorized trail use on behalf of Oregon State Parks. The survey covers trail use anywhere in Oregon, from local parks to national forests. Surveys have been sent to a sample of trail users chosen at random, but OSU would like to hear from others who engage in non-motorized trail use. Survey responses will help local, state, and federal agencies efficiently allocate funding to meet the needs of non-motorized trail users. The survey, and each question in it, is voluntary. All responses are confidential – they will only be reported as part of larger groups. Complete and return the survey within three weeks will be entered into a drawing for one of two Oregon State Parks 12-month day use passes and one $100 grocery store gift certificate. It is estimated about 1,200 people will qualify for the drawing. Responses will be most helpful if completed by November 26th.